Peter Kent (1974a) described the fine art of subterfuge so vital to getting your hands on a Japanese occupation revenue stamp in those days. To begin with, normal occupation stamps were hard enough to find. If one were so lucky as to spy the odd fiscal lurking in an unsuspecting dealer's stockbook, one faced the nerve-wrackingly delicate negotiation of a price high enough to persuade him to part with it, but not high enough to trigger his instinct to lock it up for deeper scrutiny. 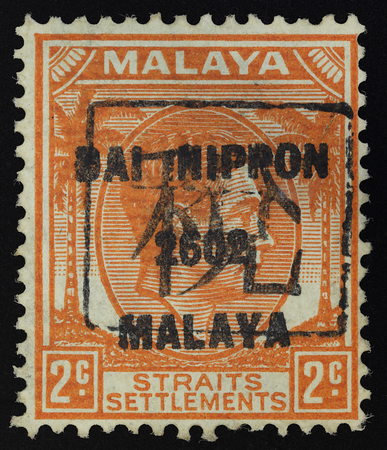 For some reason, tax-overprinted coconut definitives are more elusive than those of other Malayan stamps. Here one carries the "Great Japan 1942 Malaya" machine chop with a rare additional overprint of the kanji character for "tax". The author believes that two forms of this hand chop exist, with thin and incisive (above) versus thick and smudged strokes possibly formed by different materials, but it is not clear whether both appear on the coconut definitive. See Cockburn (2014) and Kent (1974a, 1974b, 1976) for in-depth treatment of the subject.